by Tommy Goudge (June 21, 2013) – A total of 109 drivers signed in to race on Patriot Sprint Tour versus Corr/Pak Merchandising Sprint Cars night at Ohsweken Speedway on Friday night. 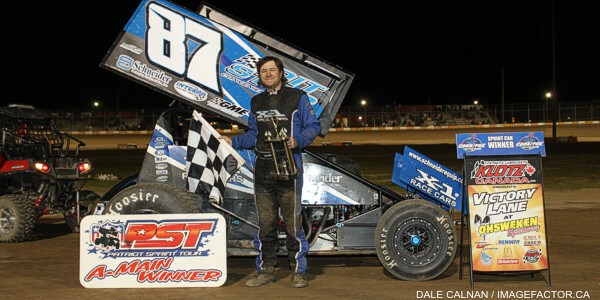 New Yorker Jason Barney was the best of the talented Sprint Car field, while Ryan Turner (Thunder Stocks), Alex Schuts (Mini Stocks), and Max Chechalk (Bombers) also visited Klotz Canada Synthetic Lubricants Victory Lane. Jason Barney started in the 9th row, but didn’t stay there long after the Sprint Car feature started. Barney used the low groove to move quickly through the field, and eventually take the lead from Jamie Collard on lap 17. 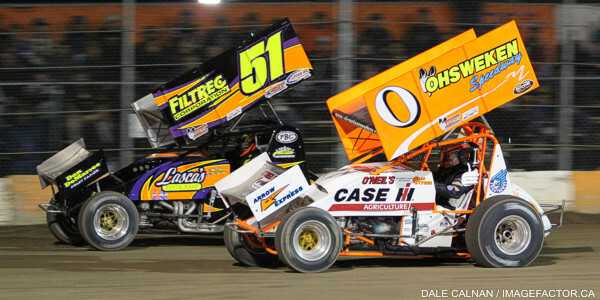 Barney then held off Glenn Styres for his first Ohsweken win since 2008. Styres settled for the runner-up spot, followed by Bryan Howland, Jared Zimbardi, and Jamie Collard. Heat races for the 30 car field were claimed by Jamie Collard, Steve Collins, Glenn Styres and Dustin Daggett, while Jared Zimbardi won the “4 Laps of Fame” Dash, and Jessica Zemken won the B-Main. Ryan Turner was looking for redemption on Friday night, after losing a feature win to a technical infraction last week. Turner took advantage when Dave Silverthorn, Jr. missed his mark in turn one, and held on for the feature win. Brad Herron slipped by to take the runner-up spot, followed by Silverthorn, Ryan Beagle, and Jim Lampman. Heat races for the 34 car field were claimed by Ryan Beagle, Dave Silverthorn, Jr., Mike Thorne, and Jim Lampman, while Murray Nicholls won the B-Main. Alex Schuts dominated the Mini Stock feature to take his first ever feature win at Ohsweken, while Rodney Rutherford, Robin Elliott, Mike Evers, and Rob Hoskins chased Schuts to the finish. Heat races for the 29 car field were claimed by Kathi Dickie, Rodney Rutherford, and Laura Hughes, while Mike Evers won the B-Main. Max Chechalk survived a few close calls and successfully negotiated traffic to take his first feature win of 2013. Jesse McDonald, Dusty DeBoer, Tim DeBoer, and Gillian Hils rounded out the top 5. 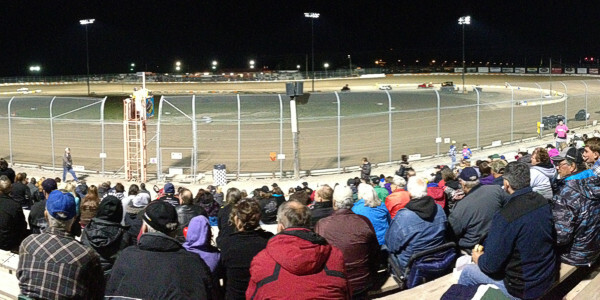 Heat races for the 16 car field were claimed by Gillian Hils and Max Chechalk. O’Neil’s Farm Equipment & Case IH Tractors present the 6th round of weekly Friday night racing at Ohsweken next Friday, June 28, featuring the Corr/Pak Merchandising Sprints, Affordable Towing & Recovery Thunder Stocks, HRW Automotive Mini Stocks, and Gale’s Auto Aftermarket Bombers plus the TUSA Canada West Mod-Lites. Spectator gates open at 6:00pm, with racing starting at 7:30pm! 1. 7x Jamie Collard (Burford), 2. 51 Bryan Howland (Auburn, NY), 3. 75 Tommy Wickham (Central Square, NY), 4. 87 Jason Barney (Constantia, NY), 5. 10 Mitch Brown (Brantford), 6. 49 Todd Hoddick (Cheektowaga, NY), 7. 94 Stan Zanchin (Fort Erie), 8. 11z Zach Zumpe (St. Catharines) DNF. No Time. 1. 67 Steve Collins (Belfast, NY), 2. 28fm Steve Poirier (Saint-Mathieu-de-Beloeil, QC), 3. 35 Jared Zimbardi (Little Valley, NY), 4. 31 John Burbridge, Jr. (St. Williams), 5. 81 Derek Jonathan (Lewiston, NY), DNS. 52 Scott Kreutter (Alden, NY), DNS. 77x Jessica Zemken (Sprakers, NY), DNS. 07x Dain Naida (Tecumseh, MI). Time – 1:56.317. 1. 0 Glenn Styres (Ohsweken), 2. 5b Justin Barger (Montrose, NY), 3. 80 Chris Steele (Fenwick), 4. 9nz Havard Daniels (Coatesville, NZ), 5. 5c Conor Mahoney (Waterdown), 6. 11 Jamie Turner (Caistor Centre), 7. 3r Shane Ross (Thedford) DNF. No Time. 1. 2m Dustin Daggett (Portland, MI), 2. 5k Keith Dempster (Alton), 3. 11j Chris Jones (Demorestville), 4.  f37 Kyle Moffit (South Dayton, NY), 5. 14h Jim Huppunen (Fenwick), 6. 90 James Evans (Beamsville), 7. 70 Jim Lingar (South Bend, IN). Time – 2:03.791. 1. 77x Jessica Zemken, 2. 49 Todd Hoddick, 3. 07x Dain Naida, 4. 3r Shane Ross, 5. 94 Stan Zanchin, 6. 52 Scott Kreutter, 7. 11 Jamie Turner, 8. 70 Jim Lingar, DNS. 90 James Evans, DNS. 11z Zach Zumpe. Time – 2:35.399. 1. 84rk Ryan Beagle (Vittoria), 2. 777x Steve Hess (Ohsweken), 3. 44 Kevin Dawson (Caledonia), 4. 13 Kacey Huffman (Hamilton), 5. 68 Aaron Turkey (Ohsweken), 6. 93 Melissa Miller (Ohsweken), 7. 911 Nick Liverance (Brantford), 8. 00 Robbie General (Ohsweken) DNF, 9. 4 Dale Gyokery (Jarvis) DNF. No Time. 1. 9 Dave Silverthorn, Jr. (London), 2. 73 Mike Miller (Cayuga), 3. 33 Jack Myers (Wainfleet), 4. 77 Brett Rodwell (Caledonia), 5. 04 Wyatt Van Wart (Cambridge), 6. 10 Jake Brown (Brantford), 7. 38 Terry Martin (Caledonia), 8. 23jr Dave Bitner, Jr. (Port Colborne). Time – 2:43.632. 1. 55 Mike Thorne (Caledonia), 2. 91 Ryan Turner (Caistor Centre), 3. 1 Chris Dickie (Brantford), 4. 12 Brad Herron (Waterford), 5. 85b Ryan Dinning (Caledonia), 6. 17 Rob Disher (Grimsby), 7. 00x Craig White, 8. 23 Trevor DeBoer (Caledonia). Time – 2:43.406. 1. 28 Jim Lampman (Caistor Centre), 2. 11r Bryce Richardson (Port Colborne), 3. 81 Karl Sault (Dundas), 4. 19 Cory Turner (Caistor Centre), 5. 4k Kevin Knapp (St. Catharines), 6. 2 Lee Winger (Caledonia), 7. 85h Brad Bacher (Hagersville), 8. 57 Murray Nicholls (Hamilton), DNS. 3b Blaine Barrow (Welland). Time – 2:43.482. 1. 57 Murray Nicholls, 2. 2 Lee Winger, 3. 23jr Dave Bitner, Jr., 4. 10 Jake Brown, 5. 17 Rob Disher, 6. 3b Blaine Barrow, 7. 38 Terry Martin, 8. 00x Craig White, 9. 23 Trevor DeBoer, 10. 85h Brad Bacher, 11. 93 Melissa Miller, 12. 00 Robbie General DNF, 13. 4 Dale Gyokery DNF, 14. 911 Nick Liverance DNF. Time – 3:31.288. 1. 1 Kathi Dickie (Brantford), 2. 66r Cole Rodwell (Caledonia), 3. 55 Rob Slater (Dundas), 4. 64 Doug Erskine (Hamilton), 5. 21 Jonathan Ayrton (Hamilton), 6. 11 Mike Giberson (Caledonia), 7. 68 Rob Twitchett (Dundas), 8. 76 Jamie Goudge (London), 9. 96t Mike Taylor DNF, 10. 16 Jeremy May (Hamilton) DNF. 1. 53 Rodney Rutherford (Waterdown), 2. 05 Dave Goodacre (Brantford), 3. 79 Steve Miller (Paris), 4. 38 John Cote (Hamilton), 5. 66 Jon Janssens (Woodstock), 6. 69e Dan Erskine (Caistor Centre), 7. 29 Lucas Lubin (Hamilton), 8. 22 Brittani Myers (Hamilton), 9. 90 Chad Smelser (Dunnville), 10. 84 Jade Pelletier. 1. 10 Laura Hughes (Puslinch), 2. 7x Chase Hess (Ohsweken), 3. 81 Alex Schuts (Oakland), 4. 7 Jason Lungaro (Hamilton), 5. 99 Robin Elliott (Woodstock), 6. 37 Rob Hoskins (Harley), 7. 265 Mike Evers (Caledonia), 8. 18x Davey Boughton (Carlisle), 9. 5 Brian Sullivan. 1. 265 Mike Evers, 2. 29 Lucas Lubin, 3. 22 Brittani Myers, 4. 18x Davey Boughton, 5. 90 Chad Smelser, 6. 96t Mike Taylor, 7. 16 Jeremy May, 8. 76 Jamie Goudge, 9. 69 Rob Twitchett, 10. 5 Brian Sullivan, 11. 84 Jade Pelletier. 1. 32 Gillian Hils (Dundas), 2. 7L Valen Longboat (Ohsweken), 3. 03 Dakota Potts (Waterford), 4. 43c Clinton Nicholls (Hamilton), 5. 35 Justin Brown, 6. 36 Skip Brandow (Orwell), 7. 6 Wayde Thorne (Waterford), 8. 14 Gerald Burnham. 1. 97 Max Chechalk (Hamilton), 2. 9 Tim DeBoer (Caledonia), 3. 23 Dusty DeBoer (Hagersville), 4. 66 Brady Longboat (Ohsweken), 5. 88 Jesse McDonald (Caledonia), 6. 28 Bob Burgess, 7. 21 Mark Bazuin (Caledonia), 8. 48 Derrick Bingham.